I don’t know about you, but I avoid clicking on PDF files like the plague simply because it takes ages for it to load, whether with a browser plugin or a desktop app. Microsoft Office files are almost the same. Why can’t these documents be opened as easily as webpages, anyway? 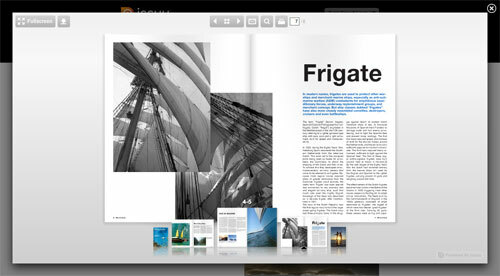 Enter Issuu, a cool platform that makes viewing digital books, magazines, and other materials much easier—try using it right now—and Smart Look, which is a piece of code you to be placed in your website that embeds various document formats (PDFs, Word documents, Powerpoint presentations) into a Lightbox-meets-Acrobat interface. Only it’s lighter and more portable because the viewer (which you can also find on Issuu itself) is powered by Flash. What actually happens is that to copy the code, Issuu scans your site for documents to import, under your account (which you’ll have to sign up for). The files on your site stay intact, but copies are stored on their servers under your username. Try Smart Look in action here. Let’s pause for a moment to reflect on the irony in using one Adobe product (Flash) to view another one (PDF). Isn’t that a sign that something is terribly wrong with the way Adobe has been handling PDF files? Will Adobe correct this anytime soon, perhaps through Buzzword, and eventually kill Issuu? Issuu and Smart Look make sense. To quote TechCrunch, Issuu really wants to kill the document download . I think that doing so makes for a better browsing experience. Scribd and Docstoc. Too clunky. And as far as inteface design goes, Issuu is a bit more polished than competitors Scribd and Docstoc, which remind me of the PDF viewers I’m avoiding in the first place. Although both have text selection while Issuu does not. Smart Look, however, erases the need for embedding the files in your pages since clicking on a link will do that for you. Now I don’t want to do any more comparisons among the three because whichever webapp you’re using, I like that there is actual development going on in this space. It’s certainly worlds better than having to open documents in a bloated old program like Acrobat! Did you try calameo.com ? I like it much more than issue… Can you please tell me what d you think about it ?